The icy words, uttered more than 20 years ago – but never forgotten – could not be further from the truth. The blonde woman, Lorri Bernson, is legally blind. 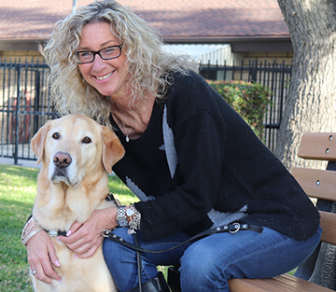 Bernson recalls the story from her office at Guide Dogs of America’s Sylmar, Calif., campus. It looks like the workspace of any other busy professional. A patchwork of supplies for an upcoming event loiters in the corner, a tower of files resides on her desk, and when her cell phone suddenly emits a cheerful sound, she reaches down to silence the device without missing a beat. It often throws people. Like the businesswoman who, while on the phone with Bernson, once declared that she didn’t sound blind. “I knew what she meant,” said Bernson. “I was probably supposed to sound a little more pathetic. I don’t sound like someone who has experienced this type of loss.” Society holds all sorts of misconceptions about people with disabilities. Bernson first encountered vision problems in 1994, when diabetic retinopathy cast a cloudy haze over her right eye. Nearly 50 percent of those living with diabetes – both Type 1 and Type 2 – will experience some form of retinopathy. The condition often goes undiagnosed in its early stages when tiny blood vessels in the retina first begin to swell. As it progresses, the vessels hemorrhage, floating a cloudy haze or creating a “spotted” filter through which the person views the world. Various laser surgeries can oftentimes correct part of the vision loss, or slow its progression, but for many, legal blindness is the end result. The progression is often gut-wrenchingly quick. Bernson continued to work in the licensing department at Paramount while undergoing a six-month period of assorted surgeries to try and correct the faltering vision in her right eye. Then, in a matter of seconds, her left eye began to take a similar path. Another series of surgeries followed. “It was a roller coaster,” she said. “Am I going to be totally blind? Wait, I can see a little bit. No, I lost it…” The roller coaster of uncertainty lasted seven years. Bernson was left with zero vision in one eye and a hazy, pinhole’s worth of vision in the other. She eventually wanted more out of life. She began researching guide dogs, and realized one of the requirements for consideration was the ability to travel independently with a cane. Not long after, she was accepted to Guide Dogs of America as a student, and received her first guide dog, Nigel, in 2002. It’s a common transformation. Guide dog trainers often report watching students blossom from fearful and tentative to confident – even in unfamiliar surroundings – when in partnership with their highly skilled guides. Having a guide dog offers more than just safety and independence. A dog is often the perfect ice-breaker. Many people find it odd, but Bernson says she’s truly happier now than when she was sighted. She is certain life with her guide dogs has had a tremendous impact on her overall attitude and positive outlook. But Bernson knows that’s not the point. Has having a guide dog ever saved her life? Every day. Editor’s Note: A version of this story first appeared in the March 2013 issue of TRIBE Magazine.